Baylor has been the most impressive team all year and hasn't lost in the calendar year. Still, the underdog label is an odd fit for Notre Dame ahead of Sunday's national title game. The last time the Baylor Bears were in the NCAA Tournament final was in 2012, when they beat Notre Dame to cap off a perfect season. The Bears are back, with one loss this time, and the Fighting Irish (+2.5) again stand in their way in a battle Sunday (5 p.m. CT, ESPN) between the tournament's top two seeds. Baylor (36-1) has been the most impressive team all year and hasn't lost in the calendar year. Still, the underdog label is an odd fit for Notre Dame (35-3) after winning it all a year ago. Last year's title game saw one of the more [thrilling endings](http://www.espn.com/womens-college-basketball/recap/_/gameId/401026260) in March Madness history, when Irish star Arike Ogunbowale drilled a three-pointer at the horn to lift Notre Dame over Mississippi State. It was the second straight win off an Ogunbowale buzzer-beater and gave Notre Dame its second national championship after losing in four title games this decade. One of those four losses came to Baylor in 2012, when megastar Brittney Griner led the Bears to a dominant 80-61 win for the second title in school history. 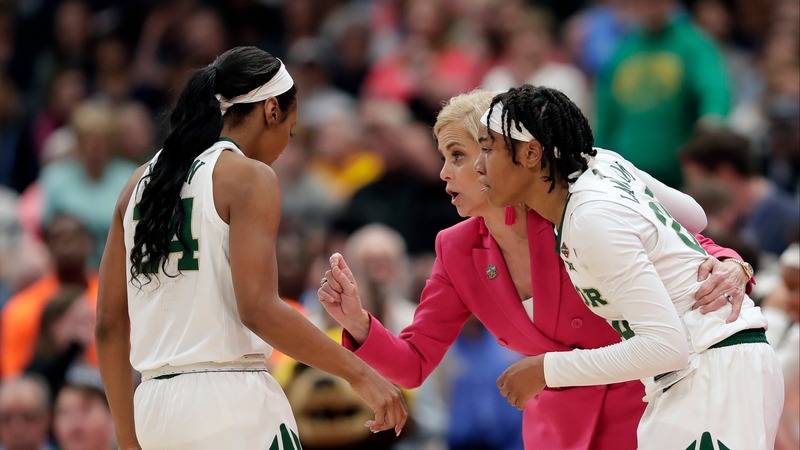 This year, Baylor is again led by a dominant frontcourt -- with Kalani Brown (15.7 points, 8.1 rebounds) and Lauren Cox (13.2, 8.4) overwhelming opponents en route to the title game. Those two excel on the defensive end, too, combining for 155 blocks in 37 games. That combination frustrated Oregon in the Final Four, when Ducks standout Sabrina Ionescu shot 6-of-24 in a 72-67 loss -- dooming the trendy 2-seed in its first Final Four appearance. Notre Dame faced a stiff Final Four test, too, rallying to beat UConn in an all-too-familiar rivalry this late in the year. Again, Ogunbowale was the star, scoring 14 of her 23 points in the final quarter to slash a nine-point deficit in an 81-76 win. The key to an Irish win Sunday may be Brianna Turner. The three-time ACC Defensive Player of the Year was once the cornerstone of Notre Dame's attack before tearing her ACL in March 2017. She still makes her impact known, like when she blocked five shots in Friday's semifinal win. That could have an outsized effect on slowing Baylor. In the Bears' lone loss this season, Stanford held Brown and Cox to a combined seven points on 3-of-11 shooting. If Notre Dame can replicate that, coach Muffet McGraw could win her third title in seven tries. Baylor has performed well in this spot. In 2005, coach Kim Mulkey led the Bears to a 22-point win over Michigan State. Seven years later came the 19-point win over Notre Dame. Now, seven years later, Baylor is the favorite to do it again -- though [many experts](http://www.espn.com/womens-college-basketball/story/_/id/26455917/women-ncaa-championship-game-predictions-baylor-notre-dame-win) are siding with the Irish. Both won by five points in the semifinals, though history suggests Sunday's game won't be close. Outside of last year's buzzer-beater, no title game has come within 10 points since 2011. Only five title games ever (since 1982) have been decided by one or two points, the last coming in a Notre Dame win in 2001. The sharp play on this game might be the UNDER. Since 1999, only two games have gone OVER the total of 152.5; both totaled 153 points, in 2006 and 2013.